Field trips at Grow Dat provide hands-on, experiential learning opportunities to students in grades Pre-K through 12. Our seven-acre site in New Orleans City Park hosts a 2.5-acre farm, produce handling and storage facilities, and a lush, dynamic wild space along our Birding Corridor, which runs parallel to the bayou on the west side of our campus. What’s living at Grow Dat besides fruits and vegetables? Why is protecting habitat for birds and other wildlife important, especially in New Orleans? This lesson begins with a farm tour focused on observation of all the living things on the farm—not just the fruits and vegetables we grow. We pay particular attention to native plant and ecological interactions. For the second half of the lesson, students venture into the birding corridor to continue their scientific observations with frames, binoculars, and hand lenses. By looking up close (hands-on observation) and zooming out (satellite maps), young people consider the importance of native habitats for the farm, the city, the region, and the planet. Where does food come from? How is the story of a Grow Dat cucumber different from the story of a cucumber from the grocery store? These questions frame the Seed to Plate lesson. Students follow the journey of a vegetable that is currently in season on the farm. Throughout the field trip, hands-on experiences and photos invite student interrogation into the differences between the industrial food system and sustainable farming at Grow Dat. Students follow a vegetable from seed to harvest, learning about sustainable farming techniques along the way. The lesson concludes with students helping to prepare and eat a snack featuring the vegetable that they learned about on the tour. Why is it important to care for soil and water? How is farming at Grow Dat connected to the broader ecosystem? This lesson focuses on sustainable farming in the context of ecological interconnectedness. 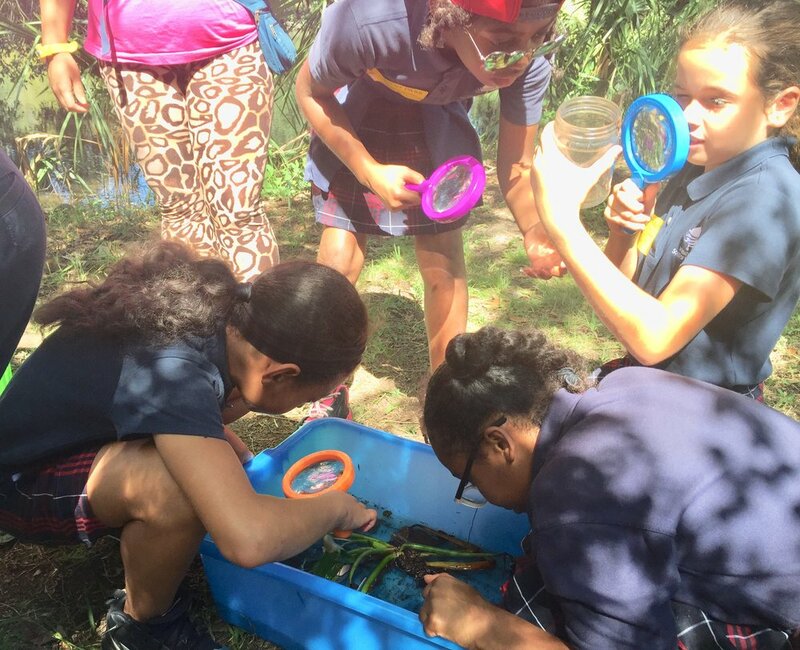 To begin, students observe the teeming life in a soil sample from the farm and a water sample from the nearby bayou. Young people have the opportunity to appreciate the diversity at these micro levels and speculate how human choices impact these habitats. Then, students tour the farm with these communities in mind, noticing how specific sustainable farming practices at Grow Dat aim to mimic natural systems and respect the ecosystem around us. The following trips are intended for grades 6-12 because of the depth of the material covered. These can also be modified to link to your curriculum or accommodate special needs students. Who has “owned” this land? How have people changed this land? How has that affected the ecosystem? How should the land be used? This lesson looks at social and environmental history of New Orleans by telling the story of our section of City Park. Students visit four sites around the farm, using images, text, and clues in the environment to consider the land in four time periods: a cypress swamp inhabited by indigenous people, Allard Plantation, a public park, and now, a sustainable farm. The lesson concludes by asking students to consider questions of ownership, access, and environmental impact as they redesign City Park for the future. What is soil made of? What does healthy, living soil look like? Why does that matter for our farm and for the climate? This investigation into soil starts with three stations where students use touch, sight, and smell to investigate the living and nonliving aspects of soil--including parent material, soil biology, and the practices we use to maintain healthy soil on our farm. Students use these understandings to collect and assess a soil sample of their own. Finally, we consider the soil profiles of different locations on a micro (New Orleans) and macro (biomes) scale and the importance of soil for carbon sequestration. Please note that during the months of July - September, our growing fields are cover cropped, which means our fields are resting! If you would like to see our farm at the height of production, the best months to visit are October - June. The cost for field trips is $8/per student. If you have any questions about field trips at Grow Dat Youth Farm, contact Field Trip and Alumni Coordinator, Kaya Jones. Our preference is to have 30 students on the farm at one time. To foster a rich and rigorous learning experience for students, we divide each class of 30 into two groups of 15. We can be flexible for larger groups if needed; please contact Kaya Jones to discuss different options. If you would like to bring two classes at a time, we can accommodate 60 students and run the field trip in two shifts. If you bring more than 60 students your field trip will need to be split between 2 days. Interested in planning a visit for college students or adults? Visit our Farm Tours page for information about Learning Tours. Teachers! Are you interested growing food in your classroom, building a raised bed, or starting a worm bin or composting system at your site? Do you want to bring a new place-based, hand-on approach to your classroom that will engage your students and get them thinking critically about sustainability? Grow Dat also offers workshops to fit your needs. We can create workshops that match your team’s interests, curriculum, and space. Come deepen your own understandings of soil or the history of our land, or learn some practical skills to bring plants into your class! Contact us and we'll create something that works for you.